Posted on 16th October 2008 — Making use of the overflow and scrollLeft DOM property to scroll elements is a much more effective use of the CPU, over animating using CSS top/left. So this episode of J4D demonstrates the same effect used in two completely different ways. The first is a scrollable timeline. A couple of readers requested a demo of how Plurk’s browse timeline works. 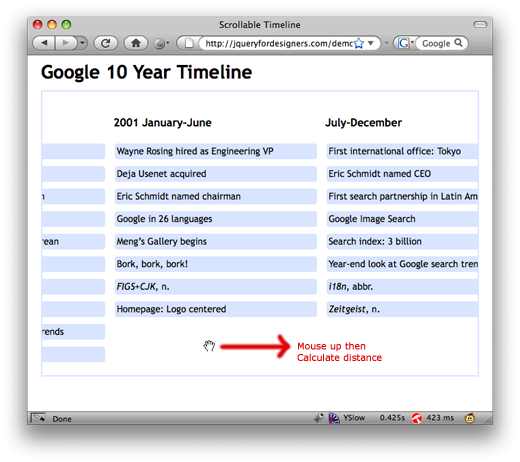 In addition, in the last month, Google released a 10 year timeline – so I wanted to show how this works. For the scrollable timeline I wanted to support both the Plurk version where the user could use their mouse wheel to scroll and the Google version where they could click and drag. I’ve taken a large chunk of Google’s history to demonstrate the effect. We set up the page by creating a wrapping div that has overflow: auto; (which we’ll change to overflow: hidden; using jQuery later on). The inner element, the ul in this particular case, is styled to have a width that can accommodate all the nested lis side by side without wrapping on to a ‘new line’ (this is done by floating the lis left and giving them a defined width). Capture the mouse down event and track the current scroll position and the X co-ordinate of the click. When the mouse moves, and it’s down, scroll the element by the distance moved from the original mouse down. When the mouse moves out of the window, trigger a fake mouse up (or cancel the captured down event). This is the full code listing used in the demo. // I'd like to see if anyone can give an example of how to speed up the scroll. // movement of the wheel - so we multiple by an arbitrary number. Using the this.scrollLeft DOM attribute again, we can create a completely different effect. This effect and design was created by Trevor Morris, but the first version he had took up a lot of CPU by changing the CSS left position on the ‘rainbow’ image. The extra empty div is the wide element and the div#rainbow is the element with the overflow that will scroll. I would love to see what else you can do: the Coda Slider is another example of the overflow and scrollLeft being used in the same way to create a completely different effect. What other ways can the overflow/scrollLeft combo be used?